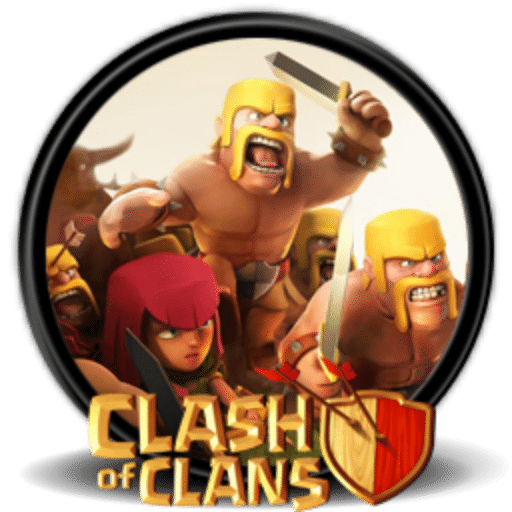 Base design plays a big role in winning Versus Battles irrespective of your attacking skills. A good base design makes your defending aspect strong, keeping your village protected from being wrecked. You should understand that if you constantly get wrecked, it will be hard for you to reach to higher levels where you get chances for better loots too. 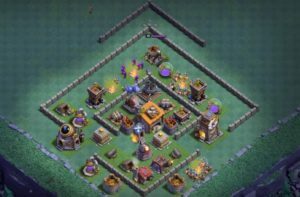 Now if you are looking for some best Builder Hall BH6 base ideas, you have landed on the right spot. Hop in. We have assembled some of the latest working and best builder hall BH6 base designs that will effectively work as anti-everything including anti-1 star and 2 stars. 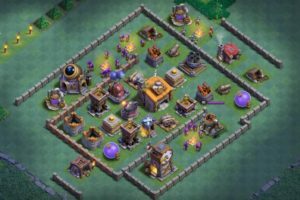 These best builder 6 base layouts are effective to defend your village against Boxer Giants, Bombers, Night Witches, and more deadly troops. Applying one of these Builder hall 6 base designs will help you out to achieve 4500 Cups. 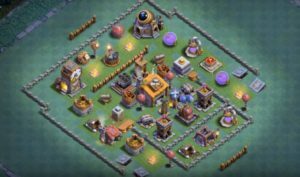 So, wasting no time, we bring you the best builder base 6 layout ideas for Clash of Clans builder base level 6. This is considered to be among the best BH6 base layouts that consist of a solid wall structure that keeps the enemies in struggling for funnelling while the core design is all packed with high damaging defence mechanisms you can truly depend on. Also, as you can see the Guard Posts are placed in such a way that any sort of attempts from the bottom. Adding to that, placing the entire builder hall 6 base towards the bottom helps your defending troops to directly harm the attacking enemy troops while giving them not enough space for attacking strategies. This one builder base 6 layout is specially designed to push back those Night Witches using Air Bomb while the Roasters are set behind Crushers to defend directly making it hard for enemy troops to give enough impacts with tank. If you look at the bottom, notice that space are left to bait ground attackers to manipulate the access point while enemies are crushed and trapped to attend fail base access. Certainly, we can take it as one of the best builder hall BH6 base designs. This is one best builder hall 6 base layout of 2018 is a lot similar with the one that has widely used with builder hall base 7 as well. 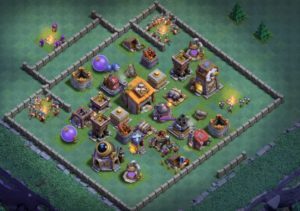 This anti 1star builder base 6 layout is perfectly designed with many features in it to defend your clan against potential troops like Boxer Giants, Baby Dragons, Bombers, and Minions. There is another great anti 1-star builder hall 6 base that looks quite easy to take down but stands on helping you achieve about 4500 Trophies while you can expect 52% destruction over the battle. Anyone of the above designed base is effective enough to defend your base whilst giving max number or trophies and high percentage of destruction on enemies. 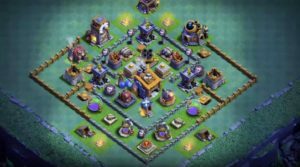 This is one of the most effective designs for builder hall base 6 layout that shall deal with anti-2 star ability. Accessing to the Builder Hall through one side is simply close to impossible as both top and bottom sides are surrounded with double-layer walls. Thus, enemies are forced to take other two sides where they are all to face splash while they are also dragged into Crusher. This base design is specially made to defend against enemy Dragons. The Air bombs and Firecrackers are set very deep there which a near to impossible taking down with advance strike. The builder base 6 layouts is great and works for funnelling troops outside of the base effectively. When you lack of sources to build your base that could stand longer from enemy attacks, this might be best option out there. 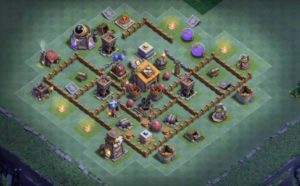 The base looks quite easy to beat and there are chances you see attacks from 1-star. However, if you able to hold the ground constantly with 2 stars, this is the base that will do for you the best. The strategy with this base is that your wall section will lead Battle Machines to the Crushers while Guard Troops will be helping them to get inside. You let them in your defences are ready to take them down. 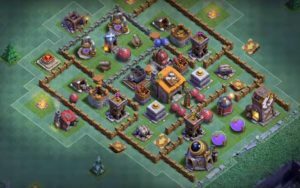 Here are some more Builder base 6 layouts that will help you 4000 to 4500 trophies with 65 – 70% destructions. Take a look at them. This one will help you achieve over 4000 trophies with expected destruction of 65% on max 2 stars. 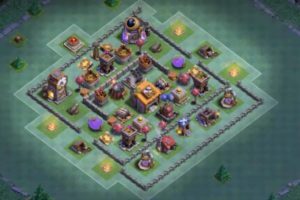 This is another most effective design for Clash of Clans Builder base level. This base is design to make enemy destruction of 70% with 2-stars while helping you achieve around 4500 Trophies. This classical looking layout is designed just great for builder hall 6 base. Right at the beginning the attacker has to face a tough place; while if they choose to attack from the top, they will have to lose so many of their troops. On the other hand, if they are attacking from the bottom, they will have to go through many buildings that it will be quite impossible for them to get the Builder Hall. And, side attacking will force them straight to the Crushes. 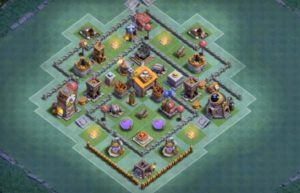 Certainly, this is one of the Best Builder Hall BH6 Base designs you will ever have. All of these above mentioned Best Builder Hall BH6 Base designs will lead to achieve more and more trophies destructing enemies with high percentages. 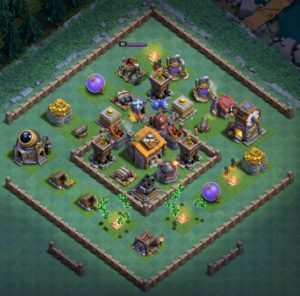 None of this Clash of Clans builder base level 6 designs are easy to beat. Most of the enemies or attacker does not have enough skill to get you over.